We continue working on the project XSR900! 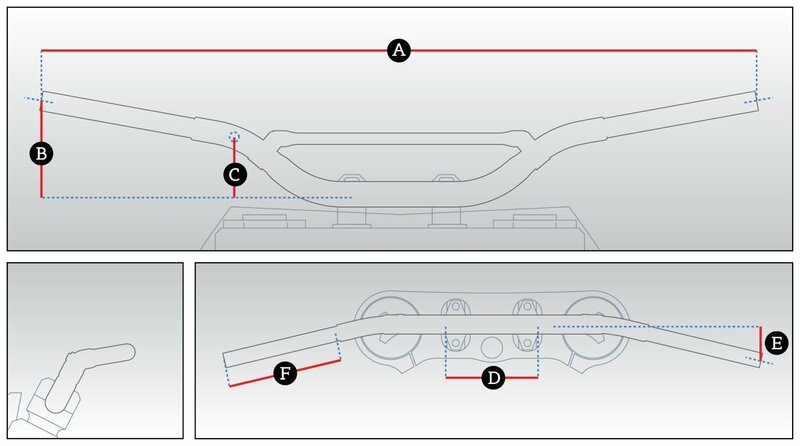 It is necessary to change the configuration of the handlebar for the footrest system LSL 2-slide, which we set with a slight shift backwards for a greater forward body angle. We want a more comfortable ride at 120-160 kmh. The easiest way is to use adjustable clip-ons, but they will radically change the image of neo-retro that we want to keep. With clip-ons, the bike will look more like a Cafe Racer with an upright riding position, but what we want is a city motorcycle, better adapted for high-speed driving than the standard one. The wider the handlebar "A", the easier it is to turn. On cross-country motorcycles, the handlebars are wide so that it is easy to steer, but at a speed of more than 100 kmh it is hard to hold on to such a handlebar, because the arms are wide apart and the pilot’s windage is too high. The larger the pullback (bend back) "E", the closer the elbows are to the ribs, and the body is more streamlined (on sport bikes, the pullback of clip-ons is big). The smaller the pulbek - the stronger the elbows stick out - this makes it easier to hold the steering wheel (on a mx motorcycle, the pulbek is small). The greater the height of the "B", the more upright is the riding position. On urban motorcycles, the riding position is upright, so the handlebar is higher than on sportbikes, where the lowest possible slope is important for better streamlining. The length of the handle (straight part at the edges of the handlebar) "F" depends on the number of controls on the handlebar. The shorter the handle length, the stronger the handlebar. On cross-country motorcycles, the handle length is short, because there are no consoles, and its strength is important. On road motorcycles, the handle length is longer, because you need to place the consoles with the ignition buttons, turn signals, high beam, etc. Lifting the base of the handle “C” (determines the handle angle) is a dependent quantity that is responsible for turning the fist and, accordingly, raising the elbows and shoulders. It is selected for a specific handlebar geometry in such a way that the wrists do not twist or tense. The length of the handlebar center for the hanger "D", as a rule, is no less than the standard and fits any crossheads and crutches. The wider this part, the stronger the handlebar. We chose an LSL handlebar. This is a famous German brand that adapts the geometry for modern road and urban motorcycles. This means that all the handlebars have a handle sufficient to accommodate the controls. Pulbek, as a rule, is a little bigger than the standard, because in Germany it is possible to drive fast, which is also relevant for Russia. Different lifts are available: for an upright and more aggressive riding position, with a slight forward inclination. The geometry of the Drag Bar handles with zero lift fits XSR perfectly. In general, the zero lift is too low, but if the clamps are adjustable, then the lift can be set with their help. The unique feature of XSR900 is that there is a dashboard fixation on the clamps. Gilles Tooling manufactures adjustable clamps for this model. Clamps are adjustable in height and shift without removing the handlebar, which is very convenient. The video shows the process of replacing the handlebar and qualities of all elements. When experimenting with the riding position, we recommend to use adjustable components and quick-release solutions, because it is expensive and time consuming to change the handlebar and dismantle all controls every time you want to fix something.